The exterior of the 2017 Grand i10 pretty much remains the same. But the addition of a few design flourishes gives it a sportier look. The 2017 Grand i10 sports Hyundai’s new design identity with the cascade design front grille and aerodynamic profile, characterised by signature Fluidic Sculpture 2.0 design language. At the front, the redesigned Grand i10 features additions like the new radiator grille, redesigned bumper, new LED DRLs (daytime running lights) and an air curtain, which has been added for higher aerodynamic stability — said to be a segment first. At the rear, it gets a dual tone bumper and new circular reflectors. While the exterior design changes are mostly only cosmetic, the Grand i10’s cabin gets a few additions that are meant to make it more modern and user-friendly. The big addition is the new seven-inch touch screen infotainment system with smartphone connectivity compatible with protocols like Apple CarPlay, Android Auto and Mirror Link. The system also offers dedicated Voice recognition, which can be activated through a button on the steering wheel. The new 2017 Grand i10 offers enhanced safety with features like the rear parking assist system, dual airbags, ABS, reverse parking sensors and a newly introduced rear parking camera with display on the touch screen. The infotainment also provides visuals from the rear camera. On the other hand, the lower variants get the 5-inch touchscreen unit which supports USB, Bluetooth, and Aux-in connectivity. The output from the 4-speakers is good enough for the car of this stature. The seats have now become more comfortable and supportive. They now get the right amount of cushioning to keep you tucked in. You get ample amount of legroom at the rear. The height adjustable driver seat and the tiltable steering wheel set you in the preferred driving position. Coming to the feature list, the carmaker this time has installed automatic climate control which adds more to the comfort factor. And the rear ac vents are just icing on the cake, especially in the torching summer weathers. Hyundai Grand i10 performs pretty well on both city and highway roads. It’s a charm to drive the car and it can take quick turns in heavy city traffic. The Grand i10 runs on front McPherson strut with coil spring and the rear is the coupled torsion beam axle with coil spring. As a Hyundai trademark, they always set the car with soft suspensions. Book Hyundai Grand i10 Test Drive at Tryaldrive. 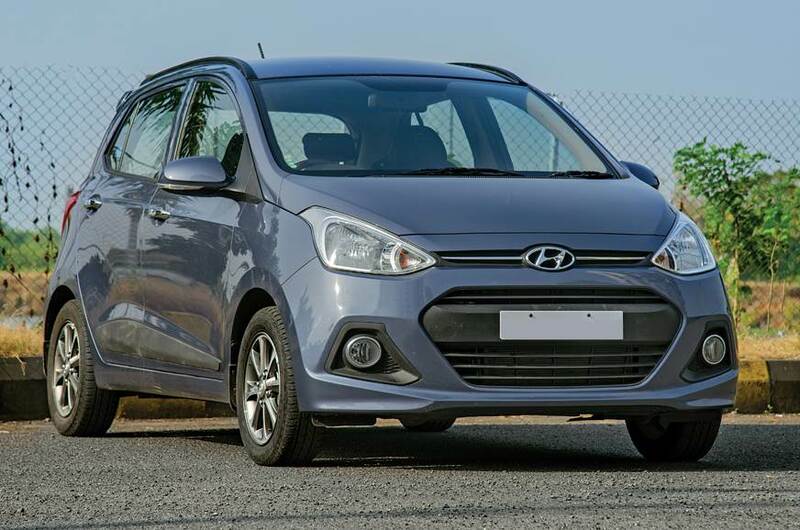 The Hyundai Grand i10 too comes with soft suspension set-up, which increases the ride quality on the bumpy city roads, but at the same time, at high speeds, the car rolls a bit but without losing control. High-speed manners may not be as impressive as some of the other cars, but it’s not appalling either. The steering of Hyundai Grand i10 is very nice to hold and has little feedback from the road. The handling is not very sharp, but the car is not meant to be a great handler, but rather a perfect city car with great ease of use, and it does that very well in that department. The brakes of the car offer a strong bite force with the pedal being firm. The car comes to standstill in a few seconds. The safety kit remains identical to the previous model and lags behind the competition. The only thing standard in the car is dual front airbags. But as you move to higher variants, you get anti-lock braking system, passenger side airbag, keyless entry, rear parking sensors with camera, impact sensing door lock and central locking. Hyundai Grand I10 On-Road Price in Chennai ranges from 5,21,616 to 8,38,725 for variants Grand i10 1.2 Era Petrol and Grand i10 1.2 Asta Diesel respectively. Hyundai Grand I10 is available in 10 variants and 6 colours. Below are details of Hyundai Grand I10 variants price in Chennai. Surely there are plenty of changes available on the new Grand i10 which not only enhanced the visual appeal of the hatchback but also at the same time have made the Grand i10 a well equipped car of its segment. The advantage of fuel efficient drivetrains along with a an upgraded diesel drivetrain surely makes the entire package more appealing. The availability of a 4 speed automatic transmission alongside manual transmission also allows the hatchback to lock horns with its rivals with more confidence. .